Here is a southern blue-ringed octopus swimming away from trouble. 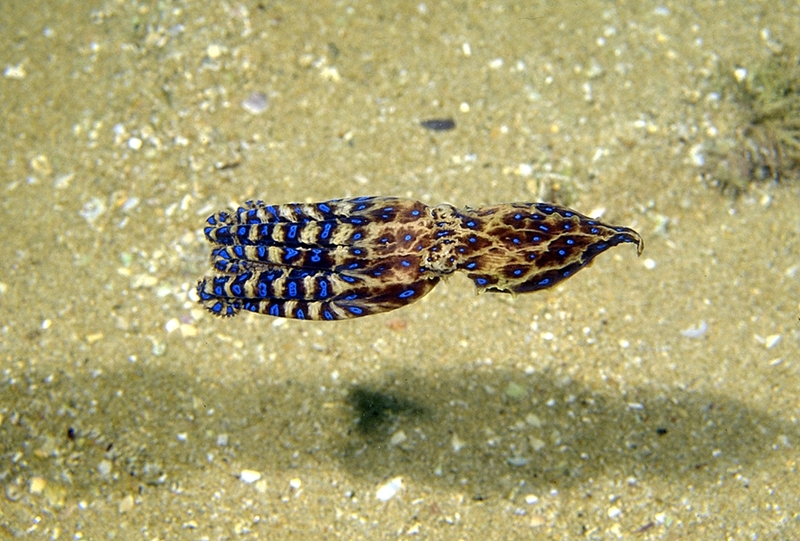 Today I want to write about a beautiful little animal, the southern blue-ringed octopus. These beautiful little octopuses have a body that measures about 5 cm across and eight tentacles that measure about 10 cm long. They are normally very well camouflaged, but they get their name from the 50-60 bright blue rings that appear on their body when they feel threatened. This is to warn potential attackers away. Southern blue-ringed octopuses are one of the most venomous animals in the world. Their venom is 1000% times more toxic than cyanide and they have been known to kill people. However, they normally only bite their prey (small crabs and fish), preferring to hide rather than attack. Don’t pick them up and you should be safe. They are able to breed at only 4 months of age. The females lay 50-100 eggs a month later and carry them around without eating until the eggs hatch after about two months. The females die soon after which is a bit sad. In all their lifecycle is only about 7 months long. Southern blue-ringed octopuses are found in shallow waters and rock pools along the south coast of Australia from Western Australia to eastern Victoria. They can often be found in discarded bottles or empty shells for protection. Are there any other interesting facts that you would like to share about southern blue-ringed octopuses?